Organized by the newly established Z Gallery, “I remember” is a group exhibition featuring paintings, videos, installations and collages by 10 Montreal-based artists of various ethnic backgrounds and ages. 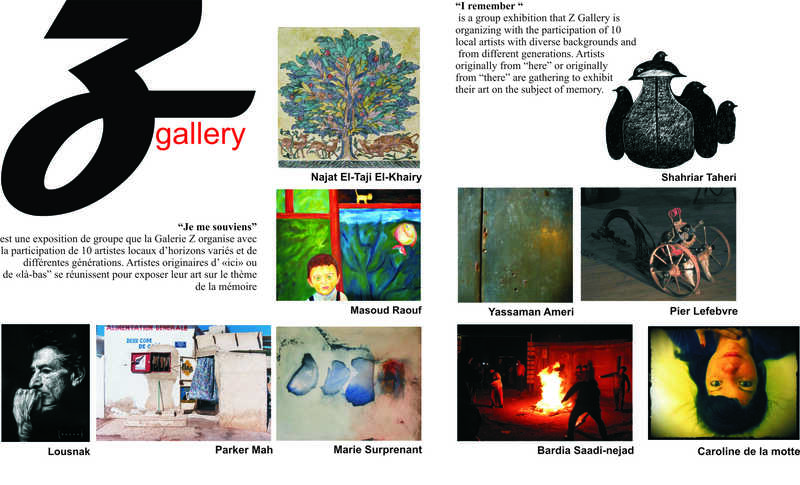 The theme of this exhibition is “memory” and is held from May 4 to June 16, 2012 from Tuesday to Saturday 12:00 to 18:00 at Z Gallery. I encourage those of you who are residing in Montreal or are planning to visit in the next month or so, to certainly make time to drop by at the gallery. The Z gallery itself is a bright spacious studio located at Montreal’s downtown plateau – one of the “coolest” and most “artsy” neighborhoods. It is established by an Iranian-Canadian artist (Shahrzad Arshadi) with the goal of providing a home for artists “from ‘here’ and ‘there’” – a multi disciplinary home for the emerging as well as established artists in our town. Well, the first exhibition lived up to its promise. On May 4th, I attended the opening of this wonderfully diverse art exhibition and prepared a photo-report of the event to share with you. Najat El-Taji El-Khairy is a porcelain artist of Palestinian origin. Her paintings (left) are inspired by embroidery and pottery and ere really pleasant to watch. Masoud Raouf is most known in Montreal for his documentary film The Tree That Remembers (about Iranian refugees coping with exile) He is a photographer and collage artist among other things. Pier Lefebvre (I could not find his web address) is primarily a sculptor and his workshop, they say, resembles a museum by itself! His installations, shown as this post’s cover pic. added a refreshing touch to the exhibition. Lousnak Born in Beirut and raised in Europe and Canada, she is a singer, song writer, photographer, painter and much more (like other multidisciplinary artists present at the gallery). Her paintings stood out, to my untrained artistic taste anyway! Caroline de la Motte says she is “a radio producer, a videast, a painter, a bathroom singer” She shared some of her paintings and a video installation with us in this exhibition and you can see some of her works in her website. Shahriar Taheri is an artist as well as a political activist. He has a set of black and white drawings resembling Persian calligraphy and acrylic on canvas paintings. MarieSuprenant (top left) has created a remarkable collection of paintings pertaining to her reflections on war. Parker Mah (top right): photos printed on canvas. Parker’s works are inspired by jazz improvisation and oral history with an emphasis on memory and travel. Bardia Saadi-nejad has made an “experimental video” entitled “Flames from Tehran” which was playing at a corner of the gallery. Also the large installation shown in background of most of the pictures above is Bardia’s work. For Bardia’s statements about his background and art, please see the gallery’s page here, as I could not find an address for his website either. Congratulations to Z gallery and all the artists and friends who helped make this happen. Best of luck!